Pueblo Bonito in New Mexico’s San Juan Basin; Photo courtesy of Nate Crabtree, http://www.natecrabtreephotography.com. Scientists have documented the environmental impacts of climate change—including melting ice sheets—and predicted rising sea levels. But can climate change disrupt culture? Reporting in Science Advances, researchers say that climate change may have been a factor in the boom-and-bust cycles of ancient Southwest civilizations in the United States. Archeologist Kyle Bocinsky, one of the authors of the study, discusses the link between climate change and past cultural transitions. Kyle Bocinsky is the Director of Sponsored Projects at Crow Canyon Archaeological Center in Cortez, Colorado. JOHN DANKOSKY: This is Science Friday. I’m John Dankosky. You’ve heard about the impacts of climate change. Ice sheets are melting at record rates, coastal towns are at risk of being wiped out by rising tides. But can climate change disrupt culture? 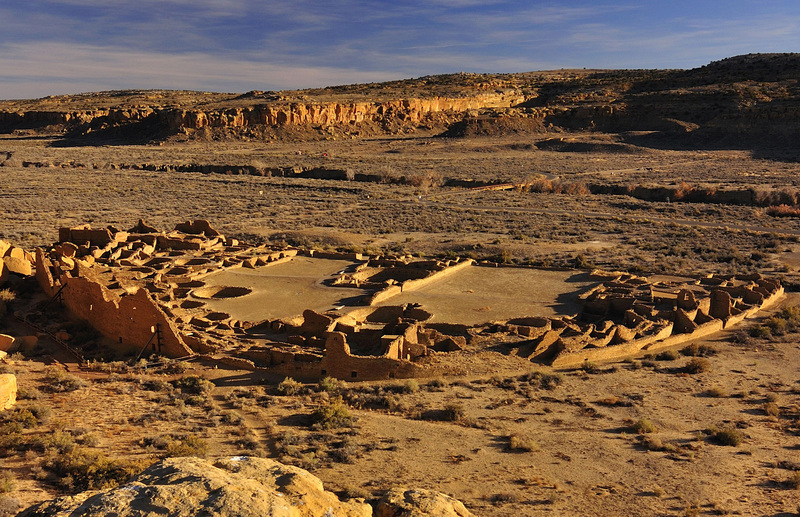 Researchers say they found a link between climate change and the rise and fall of the Pueblo, an ancient civilizations of the Southwest. Their results were published in the journal, Science Advances. Kyle Bocinsky is one of the authors on that paper. He’s also the director of Sponsored Projects at the Crow Canyon Archaeological Center in Cortez, Colorado. Kyle, welcome to Science Friday. KYLE BOCINSKY: Thanks so much for having me, John. JOHN DANKOSKY: If you want to join us, 844-724-8255. That’s 844 SCI TALK. So you’re looking at Native Americans in the southwest over 1,000 years ago. Can you describe for us what the area was like then? KYLE BOCINSKY: Yeah, it was occupied by the ancestral Pueblo people whose descendants are still with us today, and they were agricultural people. They were corn farmers and living and trying to make a living in the Four Corners region, so that’s Arizona, New Mexico, Colorado, and Utah. And life was sort of like it was today. They had this motive economy that was based around corn, and they were trying to make a living and living in towns. But those towns fell apart at different times. JOHN DANKOSKY: So you looked at tree ring data to find out what was happening with the climate in some of the years the people were productive and building. Tell us about the links there. KYLE BOCINSKY: Yeah, so we brought together two large databases based on tree rings. One is on tree ring dates from archaeological sites. So when people built with wood, tree ring scientists, dendrochronologists, can go and actually date those pieces of wood by looking at the ring widths from that wood. And so we took a large database of 30,000 or so of these tree ring dates and then compared it to a reconstruction also based on tree rings of where and when they could grow corn in the past. JOHN DANKOSKY: So what did this tell us? What did the corn growing patterns tell you? KYLE BOCINSKY: Well, it told us a couple of interesting things. First of all, it told us that droughts didn’t always impact societies in the past. There were plenty of times in which the Pueblo people did just fine in the face of pretty dramatic climate downturns. But we also found that a combination of social organization, inequality, and climate change did prompt revolutions in Pueblo society. And not just once, but four times in the Pueblo passed between AD 500 and 1400. JOHN DANKOSKY: When you talk about revolutions, like, what kind of revolutions? KYLE BOCINSKY: Well, they were sort of the up-ending of the way that people were living. At different times, people started moving into towns, and they were building these large villages and going out and farming what could have been communal farms. But these places were pretty unequal at different times. So for instance, around the early 1100’s, people were building these large structures that we call Chacoan great houses, and they would have taken a lot of people coming together and building these large buildings all across the southwest. Well, during the mid 1100’s, that entire system falls apart. There’s a lot of violence on the landscape. People move, leave those great houses, leave those villages, and start living sort of on their own out in hamlets or small farming towns across the southwest. But over time, they aggregated together again and formed large villages once again, and the cycle sort of repeated itself. A climate challenge came along, a big drought, and that undermined the sort of credibility of that social system. And people said, you know what? We’re done with it. We’re going to try something different. JOHN DANKOSKY: So talk a bit more about how we know that climate was actually what was causing the problems in the societies, how it wasn’t just some human factor that we couldn’t possibly know about. KYLE BOCINSKY: Well, and that’s the thing. We think it was human factors that really did cause these issues. But it just so happens that their basic economic product, their means of production– corn– when that fell apart, that undermined the credibility of whose social systems. And we know we know this a couple different ways. We actually can see in the archaeological record these big shifts in behavior. We see shifts at times from people being very uniform in how they’re behaving and how they’re building their homes and how they’re making their ceramics and how they’re farming. And then that breaks down and they go out on the landscape and try completely new things. And at that time, they actually created an entirely new society, and we see it in their architecture. They went from living in these villages where people were in very different size homes and had differential access to resources, like fancy pottery or deer meat, which was a prized form of food at the time, to living in these large plaza pueblos. And what I mean is they’re like large apartment buildings where everybody was in these cookie-cutter sized apartments all around a central plaza where all the ritual took place in these villages. So everybody had equal access to these resources. So they move from a society where there’s a lot of inequality to one where you have a more egalitarian, more communitarian system. JOHN DANKOSKY: So I’m sure a lot of people in places like California that have been experiencing long droughts are kind of wondering, are the droughts that you were looking at back then similar to the ones that we’re having right now? KYLE BOCINSKY: I think they are. They’re similar both in duration, but they’re even more similar in that they’re happening in a social context of great inequality in our country. And in fact, I see it not only in climate change that we see, but if you connect climate with the economy– and for the Pueblo people, they were intimately connected– we really see a lot of similarities with small but not insignificant economic impacts that can happen. Like in 2008, with the recession. JOHN DANKOSKY: All right, so without getting too political, I suppose in the last minute, I have to ask you what should we learn from this? What can we take from what you’ve learned about these ancient civilizations and apply to how we might adapt to climate change today? KYLE BOCINSKY: Well, you know I think the biggest thing is that inequality, especially within economic and ritual systems in government systems, can have a real pernicious effect and destabilize societies from the bottom up. So people have– when you live in an unequal system that’s hierarchical, people can blame that system. And I think that there is the current dialogue that’s happening in this country has to do with that type of process. JOHN DANKOSKY: Yeah. Well, we saw it back then. Maybe we’re seeing it again today. JOHN DANKOSKY: It’s on a lot of TV news channels instead, but Kyle Bocinsky’s the director of Sponsored Projects at the Crow Canyon Archaeological Center in Cortez Colorado. It’s fascinating stuff. Kyle, thank you so much for joining us. I really appreciate it. KYLE BOCINSKY: Thanks so much.